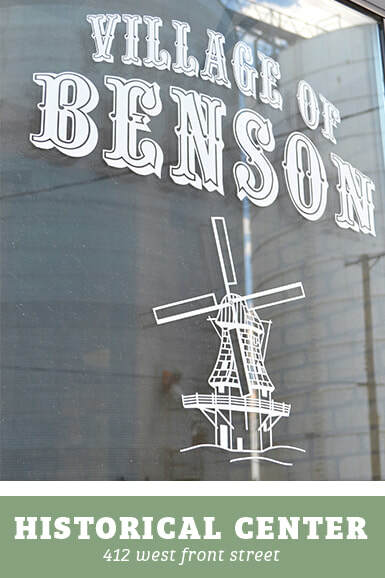 Benson is the only village in Clayton Township. The Chicago, Pekin and Southwestern Railroad was built through the township and completed in the Fall of 1872. It was soon realized that this would be a good business point and people became interested in its development. The original town consisted of 38 acres on the west side of the railroad, on property owned by John Weast. It was laid out by County Surveyor D.H. Davidson, February 20, 1873. On April 3, 1874 an addition of 27 acres on the east side of the track was laid out, and was known as Weast's Addition (John Weast was the original owner of the whole town). The town was named in honor of S.H. Benson of Streator, who was the railroad's general freight agent at the time. The township had been settled almost 20 years before the town was laid so there were farm houses not far from it and one farm house was located within its limits. O.A. Cavan moved a house from Greene Township into town and it became part of his hotel. F. D. Learned built the first house in town in 1873. Jourgen Harms and George Kirtchner opened the first store in 1873, carrying a stock of general merchandise. Before long, F.D. Learned opened a drug store. A building was erected on the corner of Front and Clayton Streets by Strawn and Rannie, who conducted a general store. Lyman Ballow was the first station agent and was succeeded by Dan David, F. D. Learner had been appointed postmaster and the first mail was received in Benson in March 1873, in the office connected with the drugstore. In 1874, Joseph Benkler opened a harness shop. The same year saw the completion of Samuel Peterson's elevator. Other business places were built by Benjamin Mauer, E Deden, Barbara Weast, Uphoff Bros., and A.H. Ahrens, Henry Forney also built a hotel. In 1876 the first brick building was erected by Jourgen Harms and Henry Heineke. Soon after this Clark Mennon and Heineke opened a brick yard and tile factory. The next year it was purchased by Simon Peterson. There were three kilns, a drying shed and a mill house. Power was furnished by a steam engine. This business was in continuous operation until 1907.